James Tonty, having over thirty years of experience in law working for a prominent national corporation, has obtained several law degrees during his career, having a devout and longtime love for American history, which has led to the publishing of this book. In law school, he was compelled to write his thesis on constitutional law. Since then, he has remained, having the aspiration to share his research and findings outside the classroom. His intent is to give creditability and honor to God for His Divine intervention that is momentous to the origin of the United States Constitution and the very establishment of our great nation. Through the historical documents of law and early Supreme Court decisions, it clearly illustrates the true intent of government rule for our nation. Today, James’ desire is to share these conclusions with all readers of this book. His writings will clearly state the facts that noticeably support the findings of law that validate the early founders’ fundamental belief of “in God We Trust,” profoundly stating “One Nation under God,” as our preamble so clearly states, and that the interpretation of the “Wall of Separation of Church and State” is not only misunderstood but somewhat elusive in its application. In his book, he will expose the true intent of the founding fathers development of the Constitution and the authentic meaning of the Establishment Clause. Proclamations, charters, acts of Congress, presidential decisions, and early years of legislation that support his conclusion. 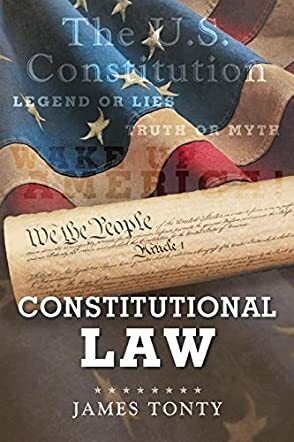 Constitutional Law: Legend or Lies by author James Tonty is filled with historical documentation pertaining to the constitutional laws of our country and how some of those segments revolve around God or Christianity. The voice is clear and concise, and comes across very intelligently. The author has a full grasp on the connections that he is making between Christianity and its place in our country's specific law makeup, and he makes his points very well and astutely. Resources cited are in abundance. This concise book packs a lot of information into its pages. Areas touched upon in history are the British Intolerable Acts, some of the states' names and how they originated, and by whom. When I first came across James Tonty’s title, Constitutional Law, I became intrigued and intensely eager. However, some of that eagerness did subside when I discovered that it wasn’t trying to relate how perverted our constitutional laws have become in this modern day. I do feel that the title is a bit misleading in that regard, perhaps a better title might be Christianity in Constitutional Law. It is still, however, a wonderful educational journey. Having not been versed in much of our constitutional laws, or how and where they originated, it was enlightening. I do feel I must warn readers that there are brief areas in the historical documentation that can be somewhat offensive. Those words are not from the author, I want to make that point extra clear, but were word for word as they were in the original documentation of early settlers. And being of Native American descent myself, it was somewhat appalling, but again it certainly put me right there in that time period. I would recommend this book to those who are interested in how our country started to set up its laws and how they connect with Christianity and God, or if you are wanting a more in-depth look into who and what our founding fathers were all about. Readers today especially need to know more about the truth of our country and its true laws. Reading this book is like stepping into a time machine; it’s an experience you don’t want to miss.